This is a story heavily influenced with deep philosophy about war and somewhat religion, the author theme is clear and concise, almost pragmatic. Though to be able to enjoy this the readers have to be accustomed on reading both academical and philosophical dissertations, actively engaging and questioning about the content that the author brought forth. If you're reading this series expecting it to be a regular narrative style, with more actions and dialogues then you probably won't be able to enjoy it. The way the author write this series shows that... more>> he's doing a lot of research on the war as subject and a lot of contemplation to state his own opinion on war with the help of the characters in his story. Gladly he's creating believable characters each with their own philosophy so there are dynamic discussion/debate in reviewing a subject matter in the storyline. Though maybe some people questioning "Why loli? ", the author doesn't use it as a creepy fan service. It's instead used to juxtapose the contrasting concept of war and children/girl, it's to show how eerie it is when a child (a little girl at that) being dragged in a war as a soldier. It arises a lot of questionable issues; that even the characters in the story itself feels troubled about it. - fan service. Despite the main character is a little girl the author never use her as fan service. - "The enemies are evil and incompetent" The enemies have believable circumstances, not the comical incompetent enemies often depicted in Japanese light novels. - "All of our allies are incompetent" Contrarily there are a lot of competent allies, most of them are intelectual. Usually side characters in Japanese light novels are depicted as dumb so the main character can be seen as intelectual, but in this series both side characters and main character are almost equal. The author is dragging the story down by explaining everything. And I do mean everything. And he's not afraid to explain it again in case, y'know, he was unclear the first time. It's a shame too. I want to know more about this world and the characters in it, but I can't handle it like this. Anime is out. Go watch it instead, it's just as awesome. And more materials than the translations. The setting is basically WWI/WWII with magic and flying mages. Not the kind of magic like in fantasy/rpg worlds but more like technology combined with magic, using tools and machinery. Unlike other worlds with magic, they are pretty technologically advance. Like somewhere in the 20th century. Don't worry about the genderbender tag, MC is a badass and it's more about action and war and stuff. The art alone is great and really shows how badass the MC is. v1c3 is just epic. Like watching the descent of a goddess/angel of death. She's literally massacring the enemies as a 1 man (loli) army. Those should be plenty enough reasons for you to try it. This novel is good, if you love strategy, warfare, magic and world-war 1/2 settings. Then this novel is absolutely something for you. As many other people pointed out, they didn't like the info dump as well as philosophy. But this is good in my opinion. I don't want a story where x and y do this, then they won with incredible odds and got tons of prestige from it. No, I want a detailed story where I can immerse myself in, knowing what different characters think and why they behave... more>> like that, as well as the necessary world-building. And even so, I think the info dump wasn't as bad as Mahouka where they literally went on for pages about how magic works. This series is my favorite in NUP, and still is even if translator drop it. The perk of Youjo Senki is we can enjoy it in three media, light novel, anime and manga. So it's like having three in one delicious treats. Youjo Senki from the premise alone speaks clearly about the author's opinion about Another world + Reincarnation setting which grows like fungus in JP web novel. Instead of Mr. Truck, we got Mr. Train and instead of saving a kid the salaryman was murdered simply for doing his job laying off people. Meeting the God, instead of panicking over his life as an Atheist he just got to argue and nickname said God. He is also not excited at the prospect of second life, his life is done so reincarnating is just a matter of course. Reincarnating with memory of an adult isn't a walk in the park, and with brain capacity of baby you will sleep off most of it. Baby can't monologue life problem even with adult soul. Reincarnating to different gender isn't exciting, even if you turn to pretty blond loli since it won't help you get a job and there's no novelty looking at your own body especially if your puberty comes late. God is God, ask and you shall receive isn't happening here. Getting reincarnated to past, just a century backward from your era is already a pain as there's no child protection service. You'd wonder how other MC of transmigration series live in older era so conveniently in era where toilet isn't exist yet. Cheat item from God makes life easier but it's not free, especially since Being X isn't sorry for Tanya's fate. Hero to your allies is devil for enemy. 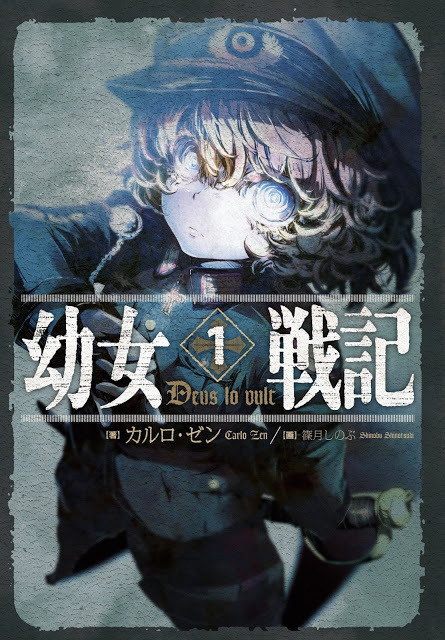 Basically Youjo Senki is a series that turns the idea of exciting second life with cheat blessing from God we see in other Isekai reincarnation story. Especially being young prodigy... more>> in magic as shown in early chapter didn't help Tanya much because grown up still can throw her around, and she understandably can't carry riffle that's too heavy for her. The cheat item she got eliminate this problem and gives her OP status, however Carlo Zen prove being overpowered subordinate means nothing if your superior is incompetent in war as larger picture. A person can't carry the whole country on her own. Tanya did take advantage of her history lesson in the past and shamelessly plagiarize a couple of them as her own to advance her career. It do her no good when she is the one who got saddled to execute that plan. The enjoyment reading this story come from hilarious misunderstanding caused by Tanya's mindset as modern salaryman, and how she tried her best to appeal to her superior as a competent and patriotic soldier. She is a very unique character, cynical, ambitious, cold and ruthless but in spite of her less than sympathetic quality Tanya appeals to me. All starts from one line of her monologue in the past, where she admit she has all complex known to man and less than a genius but she work hard to earn her salary. All the good things about Youjo Senki, in this review I will say the bad side too. This is a light novel, but it seems Carlo Zen is pushing the limit of light with his writing. By right light novel is written is format meant for quick reading, yet Youjo Senki can have wall of text on war theory and history. You can finish reading ten chapters of other series and still half-way through one chapter of Youjo Senki. Prologue of this light novel is very misleading, originality aside. When I start reading it, I thought Carlo Zen is writing a thesis in form of light novel. This could be pretty jarring to some, and skipping it didn't hurt. It explain Tanya's mindset as a very rationalistic individual and philosophy to get by in life. However... if not for a video in youtube explaining why the prison experiment and school of Chicago relevant to Tanya's character, I will never get why that thesis like prologue is even there. Yes, info dump is frequent in this light novel. It gets so bad, Skythewood says translating Youjo Senki is like writing university level thesis. At least half of every chapter is an info dump/philosophical disertation that may or may not be relevant to the story and will usually completely disrupt the flow of the story and any conversations that may take place. I feel like this could be a good story, but the author just doesn't understand the importance of brevity, concision, focus or showing rather than telling. While this novel has a ton of information being dumped on you at points, it is a well written novel. The premise is unique, you don't really see the common "I'm in a different world, and here comes my harem flocking in" at all during the chapters. All you see is a man doing as he was told and trying his best to survive. Overall the updates are slow, but it's a good read that you should at least give a try. How do.i put this? Hmm... So far, I really like how the story developed. Mixed between magic and world War tech, it gives kind of unique atmosphere in the fantasy novel. Though I can't say much about the characters, I'd say that it's well written. But then again, it's only 4 chapters so far. I hope it will be continued to be translated. I cant say what this novel basically is, since even though it's quite long, but there's still only 2 chapter (4 actually, 1 prologue, and 1 partial translation. But counting the chicken before it hatch wouldn't be a good thing, no?). So far, I quite love it. The main theme is about a guy (i still confused about his profession. HR, RnD, or some sort of management?) who died, meet with the higher being, and being reincarnated into another world. The twist... more>> is, after his death, god (or something with similar attribute) judge him for his unpieousness (is this a word? The noun is piety) and decided to reincarnate him into a world with war and magic. What I love about this novel is it's setting. The world take places in a seemingly WW2-ish era (i dunno, but it just gave that steam punk-is feels) instead of the usual kind medieval era, thus we are shown with a seemingly more intelligent war than the usual "make a line and charge to the death" kind of war. No hero, no demon lord cliche no status and lvl glorifying MC. as if the gods only care about your piety, instead of the good behavior within human it self. The plot seems to be driven by the fact that human is no longer being pieous, and the gods decided to set their path straight. Yes there were a discussion about how human had deviate from the 10 commandments but then, in 2nd chapter, seeing how human has no more faith towards the gods, and how human change from a being who always glorify their name, into a being who even dare to question the god's authority. He is quite apathetic towards other's life, yes. He's quite stern in promoting a perfect corporate gear but then, it's not like he's a psychopath who is enjoying a manslaughter. To be condemned as a despite-full being who lost his pieousness is quite to far, no? And so far, I'm predicting that it will be a philosophy journey toward human relation with the gods, so be prepared. That's all from me, and thanks for reading. I don’t really like genderbenders (hate it actually). MC is a complete badass though and rules dont apply to badasses. I only realized that I don't actually dislike gender benders when I read this (It's just that good). Only bad thing is this won’t be translated till next year mid-2016 so no new chapters until then ;_;. I'm so disappointed. Strangely enough, it was one of the very first novel I read. It got me absolutely hooked and I started reading other novels to pass time. I wasnt used to reading wn/ln but the writing/translation of Youjo Senki is top nodge, so it seems similar to English books, in my opinion. Yahoo!!! New chapter came out thanks to skythewood translations. The gender bender doesn't bother me, (and it only will if he wants to start having s*x with dudes)... only 3 chapters out so far so can't say much cept I'm loving it. Pretty much another OP reincarnation story. Hoping that Nazis don't get mentioned, and hopefully no Hitler situations either. Still too early to have a accurate rating, but so far it’s hilarious, promising and have a great world building. The story is about a man who died, meet with a self-proclaimed god, after his death. God was pissed with his pragmatic and disbelivever (?) attitude and decided to reincarnate him (as a loli) into a world with war (similar to WWII) and magic, to make him change way of thinking. A difference to other stories is that magic is scientifically researched and needs help of tools to be used. Great story but the author includes too much fluff. The author goes into great details about politics, psychology, military and gives many reasons and thoughts about a single subject. This is great for world building, however, the author ends ups repeating himself half the time. What really bothers me is the times where there is an action scene and the author ends up throwing a bunch of names from different units and factions and then giving a short summery of what happened. Very promising and fun combination of modern warfare, magic, and the reincarnation genre. There are some gaps and inconsistent jumps, but that may be resolved as more chapters are posted. A breath of fresh air in the isekai novel world! MC dies and picks a fight with god, who throws MC into a gritty, realistic, low fantasy setting where there is a war and minor magic powers! MC aspires to basically survive and live comfortably, and is dying to punch god if given the chance. It’s a very complex novel, chocked full of politics and grey moral characters. The first light novel I've read on this site and without question the best one and one of the very few that truly deserve 5 stars. The author has made the necessary research and effort combined with the brilliance of mind: the world is highly realistic, no plot armor or plot holes, the employed strategies and tactics make sense and the whole background feels absolutely alive. Besides that the author has created a net of interconnected issues/topics that create the deeper core of the novel and are made of: free will, human... more>> psychology, analysis of society, the clashes of ideology and so on. Though some might perceive it as boring I absolutely enjoyed the fact that this explored some deeper questions. Aside from that the characters are realistic as well and I can empathize with the majority of them, there are no flat and one-dimensional characters. We get an excellent insights in the thought process of Tanya and can understand each of her thoughts and resulting actions. Which also plays into the mixed in comedic aspects, that result from misunderstandings which can be very well understood when having the look from the side. This novel is far, far too complex to capture in a simple review. It's deep, amusing as hell, and well worth paying money for. In fact, I've bought every one of the (translated) novels and have the next few on pre-order. The MC is intelligent and complex and lives in a realistic and complex world. Magic is interwoven with a WWI era analog-Earth nearly seamlessly and turn what might have been a mediocre transmigration story into a delightful romp. Tanya, while powerful, is not a Mary Sue (you actually meet... more>> another character whose name is LITERALLY Mary Sue in a soon-to-be-published novel... she deserves the name) while still being relevant and effective. OVERALL SUPERFICIAL. Sound story structure. More or less decent characterization (at least for the main character). Quite enjoyable read, but nothing more than that (if you enjoy psycho lolies).